I have been so busy lately that I haven't had a lot of time to complete any of the books on my bookpile this month. So I thought I'd look at one of the many magazines I read. This is one I read religiously, and since I first bought a copy back in 2009, I haven't missed a single issue. Today I bring you an Australian gem, Frankie Magazine. Pictured is every single issue I own, all 21 of them. Can you tell I love Frankie? Frankie is a bi-monthly magazine which covers content relating to; music, fashion, photography, art, craft and other cultural elements. It was launched in 2004 by Louise Bannister and Lara Burke. Since 2008, Bannister has been replaced by Jo Walker. Frankie is owned and published by Morrison Media. 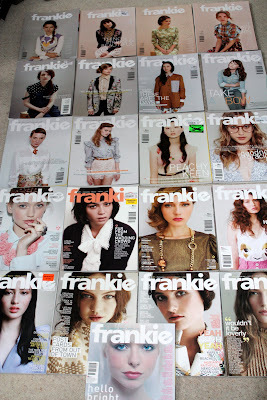 Frankie is the highest growing magazine in Australia and approximately 210,000 people read the magazine globally. A pretty nifty statistic for a niche magazine. I love that Frankie is not just your typical magazine, and I think that's what initially drew me in. Their magazine contains the perfect balance of stories, features & some editorial. It always seems to have more substance than a lot of the other magazines targeted at the age group Frankie is marketed to. As someone who loves stories, especially hearing other people's stories Frankie is perfect. They also do regular features where a series of guest writers do a story on a particular topic, 'Spaces' which looks at lovely people & their homes/workplaces around the world & 'My Story' which looks at a unique individual who has something interesting to share with their readers. Frankie have also published two recipe books; Afternoon Tea & Sweet Treats, showcasing recipes your Grandma may have made for your parents, a photography book called 'The Photo Album' & a book on lovely homes+workspaces called 'Spaces'. They also do calendars & diaries annually. Oh, and if you're a gent, Smith Journal is published biannually. Basically I love Frankie, and you should too! Track down a copy of the latest issue now if you're eager, Foxes have the latest issue & some of the older ones which may take your fancy. *For more Frankie goodness click here.